Pradhan Mantri Jan Dhan Yojana is all about giving easy access for various financial services to all household, rural as well as urban, forms the main objective of the scheme. The modern financial system has been structured to give all possible benefits to small traders, manufacturers, household etc. However, according to the official reports, less than two third of this population are being able to avail all the financial services available. This reflects hindrances in an individual’s growth and consequently makes the prospect of nation’s growth stagnant. Under this mission, not only all the household will have an individual bank account, but would also be provided indigenous Rupay Debit card. Other features include easy access to the credit facility, insurance and pension services as part of social security. The weaker and the poor section of the society will now have easy access for financial services such as opening savings and deposit bank accounts, remittance etc. PMJDY bank accounts can be opened with zero balance in any nearest public bank. However, if an individual wishes to have a cheque book, then a minimum balance needs to be maintained. There are multiple benefits provided under this scheme in order to encourage more individuals to enroll under this mission. Benefits like, interest on the deposit, coverage up to 1 lakh as accidental insurance, life insurance cover for 30,000, easy transfer money across India, overdraft facility after 6 months, are few special benefits. The introduction of mobile banking facility is also in the pipeline. This mission has been established on 6 pillar objectives, these are universal access to banking facility, providing basic bank account with overdraft facility and repay debit card, financial literacy programme to enhance the financial knowledge for using different financial instruments, the creation of credit guarantee fund, providing micro insurance, and unorganized pension schemes. The first three objectives would be given priority in the first year of the launch of the scheme. Finance Ministry also stated that in order to achieve the objectives of PMJDY, collaborative strategic plans with appropriate stakeholders is proposed. Public -private partnership is also being encouraged to participate massively under this mission. Another key strategy is employing Bank Mitr (Business Correspondent) outlets, which will well be equipped with required infrastructure such as Micro Atm, biometric scanners, printer internet connectivity etc. for easy convenience of the public. 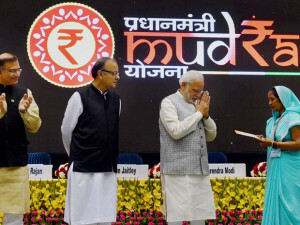 Shri Narendra Modi stated, that all the economic resources of the country should be utilized for the betterment of the poor and this would begin from this mission. The main motto of the mission is “sab ke sath sab ka Vikas”, which emphasizes the development philosophy. The role of technology is very vital under this mission. Proper utilization of modern technology will help to reduce the cost for managing the entire planned structure. Latest technological products like e-KYC, IMPS, AEPS, mobile banking are introduced to speed up the process and to reduce the cost at the same time. Pradhan Mantri Jan Dhan Yojana has also got an entry in Guinness book of world records for opening maximum bank accounts in 1 week. Around 18,096,130 banks accounts were opened as part of financial inclusion campaign and is achieved by Department of Financial services, Government of India from 23 to 29 Aug 2014. This mission has a strong focus on the use of technology and also incorporates lessons learnt from the earlier missions. This mission is termed as gigantic and referred as the national priority. With the objective of one bank account for every individual, this mission has already shown results of improvement. As per published reports, 19.02 crore bank accounts were opened and with approx. deposit of Rs 25913.56 crore. The comprehensive timeline to achieve the overall objective is by 14th Aug 2018. In spite of many efforts, this mission is also facing much criticism. Experts are referring this as a political gimmick for the upcoming elections. Nevertheless, despite the politic issues, this Yojana definitely promises enormous growth in public bank sector and creating mass awareness about different financial services available for public. Gold Monetization Scheme Yojana Kishor loan under Mudra bank?